The Teaching Center of Accordion "Marta Szokeova" in Bratislava, Slovakia and the Hungarian Accordion Organization based in Budapest, Hungary will jointly host the COUPE MONDIALE 2003. The Coupe Mondiale is an INTERNATIONAL COMPETITION FOR ACCORDIONISTS under the auspicies of the Confédération International des Accordéonistes (C.I.A.) founded 1935 in Paris. The C.I.A. is a member of the INTERNATIONAL MUSIC COUNCIL (IMC-UNESCO). This year for the first time, the CIA Coupe Mondiale categories will be held in two countries. 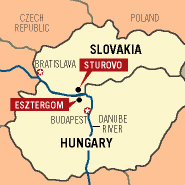 The cities of túrovo, SLOVAKIA and Esztergom, HUNGARY are located accross the Danube River from each other. The cities were connected by Maria Valeria Bridge until it was completely demolished during war times. Now, almost 60 years later, the Maria Valeria Bridge stands again, re-uniting these two cities. The Coupe Mondiale will bridge the gap between these two cities bringing international delegates, guests and contestants to both cities on both sides of the Danube during the week long Coupe Mondiale celebrations. a. Candidates must be entered through the CIA voting member organization(s) in their respective country. If a candidate is from a country where there is no CIA voting member organization, prospective candidates are requested to apply directly to the CIA, subject to acceptance, until such time as a voting member entity is established in that country. b. All entries are subject to acceptance by the CIA Executive Committee. In the case of non-acceptance, the applicant and/or the sponsoring member association will be advised in writing of the reason(s) the entry was refused. c. When registering at the event, the candidate must present to the organizers, an official birth certificate and valid passport(s) or identity card, bearing his or her name, age and nationality. The organizers will determine the candidate's nationality based upon his or her passport(s). d. No applicant may be refused entry for religious, political or racial reasons. Nonpayment of fees by the entrant and/or the sponsoring member organization may constitute reason for non-acceptance of an entry. Suitable ability and compliance with the rules of the competition are required for final acceptance. Candidates are requested to fill in the official entry form provided by the General Secretariat. with EURO only or the fee must be remitted to the CIA Secretariat in form of an International bank-cheque payable in EURO and bankcosts of EURO 10,00 must be added. (eg: Total: SENIORS EURO 70,00 - JUNIORS: EURO 50,00). Entry Fees must be received no later than 14 days after the entry deadline. A candidate's entry implies acceptance of regulations, the system of judging and the jury's decision as being final. Entered candidates not arriving or competing without apology will be excluded from subsequent Coupe Mondiales. a) Each candidate must provide at the competition three (3) published copies of his/her Own Choice Music for the Jury. If the piece is published, then published copies must be used. If unpublished, then manuscript copies are acceptable. b) The copies of each piece are to be tied together in a single bundle, each copy clearly labelled with the name and the country of the candidate and handed over to competition-office after arrival. There are no restriction as to make, size or type of accordions used by the candidates, but electronic attachements may not be employed. a) Contestants may use only one composition per composer per round. For example: A candidate competing in the Coupe Mondiale is required to play J. S. Bach in Round I as part of the Test Section, so the candidate may also then play one composition by J. S. Bach in Round III as part of their Choice Program. Exception: This rule does not apply to the Senior and Junior Virtuoso Entertainment sections. A candidate may play more than one piece by each composer if desired, however they should continue to observe the rule that music should be of a different style and character. b) must include opus numbers and any other identification such as catalogue numbers and individual movements for each selection performed. c) must list whether the compositions are published. d) must list full name of composer and the arranger if applicable. e) must give the playing-time for each selection. f) must send a photograph in passport size together with the entryform to the secretariat. g) the signature on the entry form is a statement saying that the candidate has read the rules and understands and accepts them. h) for Virtuoso Class only: if music is not available, please write a short explanation. i) First Place winners in a category, may not enter that same category in subsequent years. Contestants are judged in all sections on overall musicianship, including technical proficiency and stylistic understanding of all music performed. THE DECISIONS OF THE JURY ARE FINAL. Less than one minute under the minimum playing time or less than one minute over the maximum playing time - no mark penalty. More than one minute under the minimum playing time or more than one minute over the maximum playing shall have a 1 point penalty for each minute or part thereof. Example: The candidate has a playing time of 22:30 minutes in a category with a 20 minute maximum playing time limit. Therefore this candidate would have a 2 point penalty deducted. Accommodation will be arranged by the organizer but is to be paid by the candidate. There are options of Hotel or Hostel in both túrovo and Esztergom and range in price from approximately 12 EURO - 40 EURO per per night depending on the option chosen. Please see the page for accommodation prices in túrovo and Esztergom for full details. Lunch and Dinner will be approximately EURO 10.00 per day if purchased seperately. All participants must announce his/her arrival and departure date and time with the entry or registration form. Participants must have a visa and should request an official invitation to get a visa when entering the competition. All participants must register at the Hotel Thermal in Sturovo, Slovkia on October 20, 2003 beginning at 1:00 PM. The draw for playing order will be at 6:30 PM at the Hotel Thermal. The English language version found here on-line at the official CIA website shall be the definitive text.